Contains several natural ingredients studied for their ability to fight the effects of stress. Helps soothe, restore energy, relieve fatigue. Based on the latest advances in neuro-science. Acts deep-down to counter mood problems (depression, demotivation, ‘the blues’).. 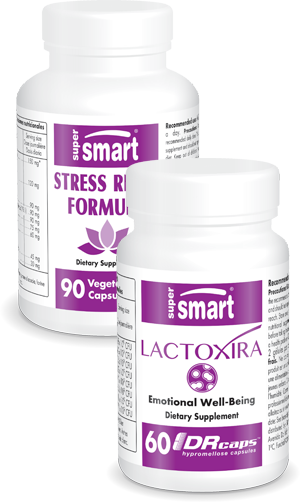 Supports a healthy microbiota and optimal ‘microbiota-brain’ communication. Contains eight probiotic strains supported by clinical trials..
Also contains prebiotics to ‘nourish’ the probiotics.